Just a reminder that I will be exhibiting this year at West Cape Howe Wines. 10-5 daily, through to October 13. 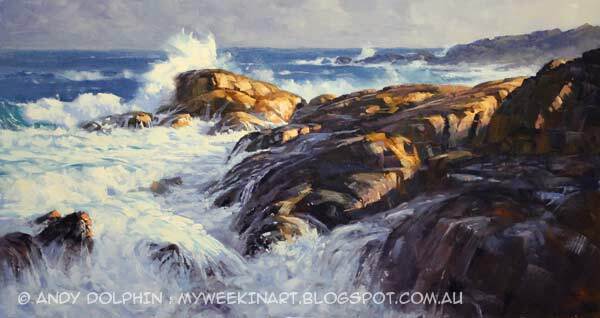 My painting "South coastal" (below), which took out second prize in the recent Australian Artist Magazine "Seascapes, Rivers & Lakes" competition, will be on show and available for purchase. I will also be showing several of my most-recent plein air paintings. The exhibition also features work by ceramic artist Jonathan Hook. West Cape Howe Wines is on Muir Highway, about 10km west of Mt Barker, WA. The Trail officially starts on September 28. Exhibition guide books are available throughout the Great Southern or you can follow the link to the website at the top of this article for more information.